In Bayern’s midfield triangle, Thiago adopted the most advanced role while Arturo Vidal and Xabi Alonso assumed deeper positions in the structure. The pairing were important in creating stability in the build-up, and allowing the Spaniard to enjoy a more free role higher up the pitch where the world-class midfielder asserted himself in one of the performances of the season. Thiago’s movement was typically dynamic, and he would move to become an active participant in most areas of the midfield, as far-reaching as deep in the right half-space. The number six was most prominent however, in the advanced spaces from which he would put his team ahead. He frequently looked to find gaps within the RBL midfield – which was less compact than usual – and then use his outstanding pressing-resistance to maintain and continue the attack as well as engaging in Bayern’s strong interplays. Thiago’s movements were often in accompaniment with supportive runs of his teammates, which enabled him to become free. Lewandowski regularly drifted to the right wing, where he could contribute to potential overloads and free Robben, but importantly provide Thiago with greater freedom centrally. A range of structures and movements were seen on the left, with Costa sometimes dropping in to occupy Keïta and free Thiago in space, while Alaba’s variable runs in- and outside helped to create room too. His activity between the lines allowed him – and thus Bayern – to form attacks from strategically-strong areas of the pitch – something which teams lack when playing against RBL. Some form of Bavarian presence between the lines also allowed the hosts to switch possession from higher positions, allowing attacks from Robben and Lahm to begin in more threatening positions. Thiago was sometimes freed by Costa’s inside movement to help occupy Keïta. 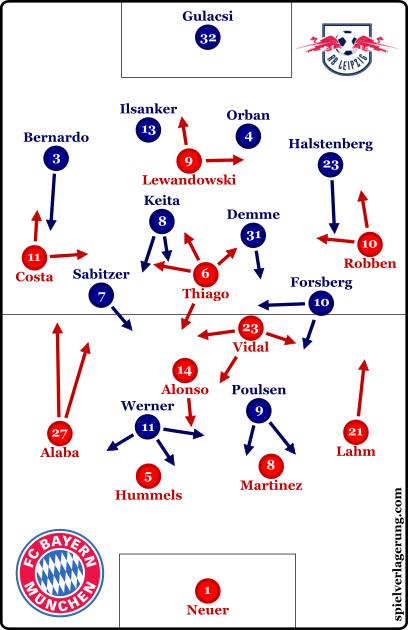 These movement schemes were part of an overall attacking strategy for the Bavarians, who aimed to overload the left side of the field through the trio of Alaba, Costa, Thiago and at-times Lewandowski, Vidal and even Hummels too. The structures were dynamic, with the versatility of Alaba allowing him to play on the touchline or inside, while Thiago acted as a combinative influence in the half-space. The plan was evident from build-up, which commonly saw a pattern of right-to-left circulation in order to create space for Hummels to make the first progression. Vidal would move towards the left half-space to overload the areas in-front of Poulsen, who was commonly moving out (and too slowly) as the ball reached Hummels. In doing so, they consistently had a means of breaking Leipzig’s press, and finding space for one of Alaba, Thiago or Costa in the emerging gaps ahead of them. Crucial to advancing possession during these moments was the speed of combinations, which allowed Bayern to beat any pressure of Leipzig. The rapid wall-passes of Costa into the inside gaps specifically were crucial in giving Bayern access back into the centre after the wide-play dragged Leipzig out. Thiago or an underlapping Alaba were the common beneficiaries, and could then carry the ball diagonally towards goal and access more dangerous spaces as opposed to continuing the attack down the isolated flank. A common pattern from these left-sided overloads would be to quickly switch the ball, to initiate an attack from Robben and Lahm. The Dutchman would typically move inside and sometimes received the pass from a rather narrow position, while Lahm overlapped wider. During these moments, Thiago’s high position offered good presence in the spaces behind Lewandowski, and such a pattern was evident in the opening Bavarian goal. Through this wider strategy, Bayern were able to force a number of isolations for both Costa and Robben to use against their full-backs. Their ability to diagonally access the middle of Leipzig’s block allowed them to create dangerous attacks instead of being restricted to the wider areas. In many ways it was reminiscent of the strategies Guardiola and others have used against Bayer Leverkusen in the past, resorting to combinations in wider areas instead of getting into a battle for the centre. Ancelotti’s team executed it brilliantly too, which was a result of individual qualities and the best display of tactical synergy this season. Their job was made far easier, however, by a poor and uncharacteristic performance from Leipzig. The success of Hasenhüttl’s side in the first half of the season has been in large part down to their un-rivalled pressing game. Yet in their most important game of the season, Leipzig made a completely uncharacteristic performance, missing a number of their key elements such as the intensity within their block, and their access during oppositional build-up. Leipzig were unable to maintain an ability to pressure the ball, which allowed Bayern to find Thiago between the lines on a frequent basis. Their problems stemmed from the earliest moments of their defensive game, where they struggled signififcantly to sustain access in their pressure. Werner and Poulsen were often far too passive in their movements out of possession, not only in engaging the Bayern players, but in initially establishing a position to do so. The ball-far striker was too distanced from the centre-back to challenge him on a switch of possession, which Bayern used (particularly from Martinez to Hummels) to create space in the left half-space to advance. Leipzig’s ball-oriented shifts against Bayern’s build-up were often of insufficient speed and accuracy, which contributed to their access-issues. Against Bayern’s circulation, the defenders often moved too slowly from one side to the other, and were unable to find an adequately-close position to the ball. This was often the case in the covering striker, when emerging from the deeper position to engage his centre-back. By not adjusting to the position of the ball correctly, the RBL players were often too far away from it to properly apply pressure. The wider-focus of Bayern’s possession was then poorly defended, as Hummels and Martinez (and sometimes Vidal) were given too much time to find the appropriate penetrating ball. Horizontal circulation in Bayern’s build-up allowed them to easily create space as Leipzig weren’t shifting accordingly, and advance the ball down the wide areas through the widely-oriented structure. Credit must be given to Bayern’s build-up, which was swift and well-coordinated to quickly penetrate the first line of pressure. Vidal’s dropping movements helped to stabilise the first line, and create appropriate distances between the back three in order to make adequate pressure difficult due the distance required to cover. The sheer ball-playing ability of Bayern’s deepest players was also influential in allowing them to bypass Leipzig in a more direct manner, with penetrative vertical passes into Thiago, or longer, lofted passes to the ball-far side. When Alonso dropped into the first line, he was able to play some excellent flat diagonal passes towards Costa who made movements in behind the defensive line. Bayern’s speed in their combinations, as mentioned above, was important in reducing the access of Leipzig’s pressure, particularly during wider developments. Through a fast movement of the ball, Leipzig struggled to maintain an ability to challenge it and, combined with well-timed and variable off-ball movement, Bayern could break the press consistently. Aside from their pressing, issues could be found within the defensive block too, which lacked the usual control which has overcome many high-quality opponents so far. The distances between the players within the middle were often inadequate, with the lane between the two sixes commonly being open. This lack of compactness is completely out-of-the-ordinary for Leipzig, and gaps were available for Thiago and co. to receive the ball and attack through the middle. Moreover, the lack of pressure at the front of the block meant that Bayern were gifted with plentiful opportunities to exploit their opponent’s poor coverage of the space. This lack of compactness and poor distances within the block could’ve been somewhat masked with a high intensity, yet they were lacking in this department, too. When Bayern were able to move the ball inside Leipzig’s defence, the usual high-pressure reaction was nowhere to be seen, allowing Bayern to play through it. The usual pressure of Keïta and Demme, who are able to control large spaces with their defensive activity, was non-existent and thus players such as Thiago were able to enjoy time in dangerous areas. Of course the issues are inter-related – the poor distances between the central players made access weak, and thus it became difficult to reach their typical intensity. In some moments, there were just inexplicable errors in the Leipzig pressing. Thiago once received the ball between the lines with very low compactness on a completely unchallenged pass. Such scenes typified an underwhelming performance by the visitors, whose press looked almost unrecognisable from the game that’s taken the Bundesliga by storm. Leipzig’s issues multiplied when they were reduced to ten just 30 minutes in. They were already trailing by two, rendering a comeback near-impossible and hopes of improving their pressing game were diminished. The issue lied mainly in their pressure of Bayern’s first line, as their 4-4-1 formation further dampened their inability to generate access. They still attempted to press Bayern, and Keïta or Demme sometimes moved higher to support Werner, who was now the lone striker, but it was largely insufficient in creating enough presence to disrupt Bayern’s build-up. There were some dangerous moments, such as when Alonso was caught out by moments of pressure, but Leipzig rarely threatened overall. The hosts could now build their attacks with even more freedom, resulting in more clean progressions and thus a better start to their attacks. Good build-up to initiate attacks can have a wide array of benefits, which is why managers such as Guardiola and Juan Manuel Lillo have prioritised this moment in possession. They can result in attacks starting closer to the opponent’s goal, with better momentum for combinations, create more space for the resulting attack and help to develop more appropriate structures for combinations, to name a few. Bayern enjoyed a lot of these benefits, and with a greater ability to construct their attacks, they controlled the game and were content to lessen the pace for a more stable match rhythm. 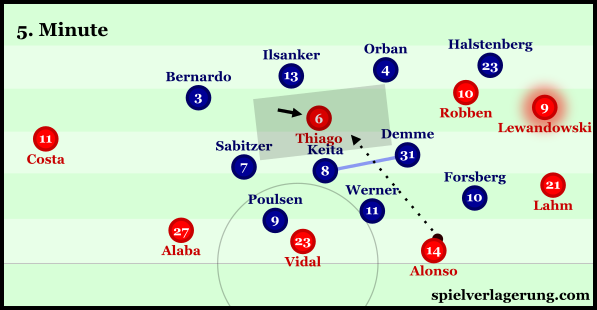 They dominated the first line, and easily outnumbered Werner – too much so at-times, but the game-state allowed it. 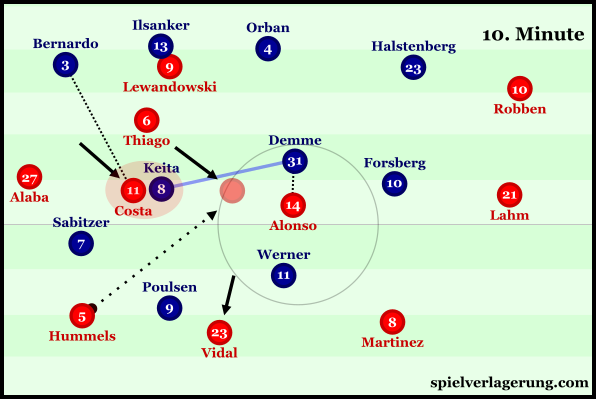 Leipzig’s inability to generate and sustain access was typified in Bayern’s exchange of passes before Hummels’ direct pass saw Gulacsi bring down Costa for the penalty. Had Forsberg stayed on the field, and Leipzig improved their defensive game, then there could have been life left in the game. But they didn’t, and there wasn’t. Bayern continued their performance from the first half, and proceeded to dominate, amassing a number of good-quality shots and stopping Leipzig from creating any. They saved their best performance for the most-important game of their Hinrunde, and handled the visitor’s pressure masterfully. Thank you Mr. Payne for this Bundesliga analysis. I must admit that I am a bit sad because of the fact that Rb wasn’t able to execute it’s plan in this match after a lot of extremely dominant games. Bayern did a great job taking away Red Bull’s transition game keeping possession well in a patient manner, not forcing passes into the midfield and final third. Also Bayern took away the knockdowns and second balls away from the Red Bull’s. Big tactical advantage Leipzig relies on. Most of the game Bayern had Hummels or Vidal (two players very good in the air) on Poulsen winning or contesting the long up to him and Munich always had someone around for the second ball as well. The tactical plan by Bayern was well executed!